the amount specified in the promotional code 2000 RUB. Thus absolutely spend any amount of costs up to 2000 rubles will be reimbursed within 5 days! Attention! Use promotional code can only be a new Google AdWords account, which is not more than 14 days from the date of registration. 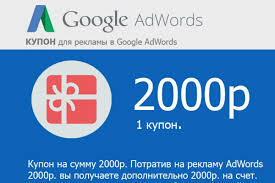 Все отлично, рабочий купон Adwords на 2000р.